Cytokine with immunoregulatory activity. May promote the transition between innate and adaptive immunity. Induces the production of IgG(1) and IgG(3) in B-cells (By similarity). May play a role in proliferation and maturation of natural killer (NK) cells in synergy with IL15. May regulate proliferation of mature B- and T-cells in response to activating stimuli. In synergy with IL15 and IL18 stimulates interferon gamma production in T-cells and NK cells. During T-cell mediated immune response may inhibit dendritic cells (DC) activation and maturation. Guan, Wang, Meng, Shi, Jiang, Xiao, Shi, Xu, Zhang: "Increased IL-21/IL-21R expression and its proinflammatory effects in autoimmune thyroid disease." in: Cytokine, Vol. 72, Issue 2, pp. 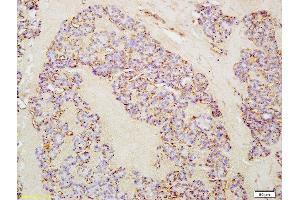 160-5, 2015 Method employed by authors: Immunohistochemistry (Paraffin-embedded Sections) (IHC (p)) (Sample species: Human).